, father to the preceding, and a considerable writer in the last century, was descended from a very ancient and honourable family, and born December 15, 1602, at his father, sir Thomas Pope Blount’s, seat at Tittenhanger, in Hertfordshire. 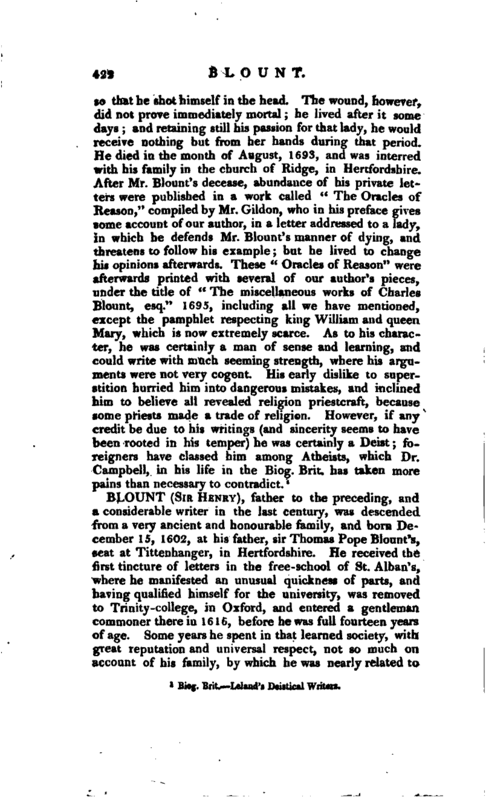 He received the first tincture of letters in the free-school of St. Alban’s, where he manifested an unusual quickness of parts, and having qualified himself for the university, was removed to Trinity-college, in Oxford, and entered a gentleman commoner there in 1616, before he was full fourteen years of age. 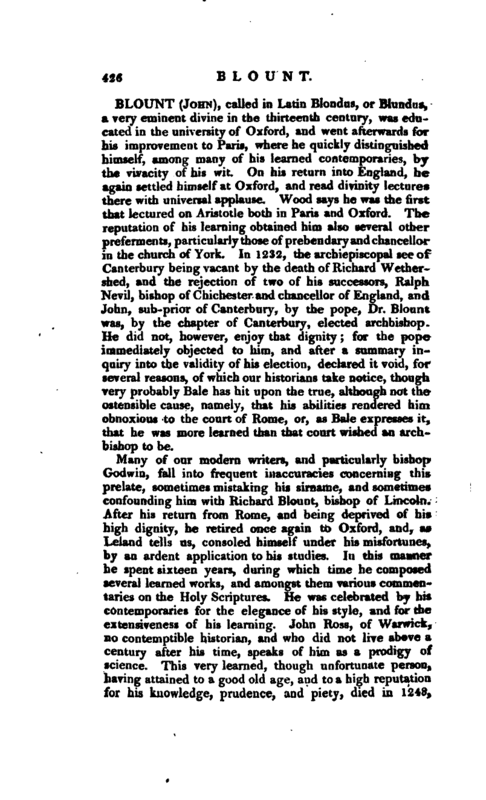 Some years he spent in that learned society, with great reputation and universal respect, not so much on account of his family, by which he was nearly related to | the founder, sir Thomas Pope, as from his personal merit. For in his youth he was of a cheerful disposition, a sprightly wit, an easy address, and frank and entertaining in conversation, charmed all who were of his acquaintance, and was justly esteemed as promising a genius as any in the university. In the year 1618 he took the degree of B.A. and soon after left Oxford for Gray’s-inn, where for some time he applied himself to the study of the law, and set out on his travels in the spring of the year 1634, being then lately become of age. He made first the tour of France, part of Spain and Italy, and then passing to Venice, he there contracted an acquaintance with a Janizary, with whom he resolved to pass into the Turkish dominions. With this view he embarked on the 7th of May, 1634, on board a Venetian galley, in which he sailed to Spalatro, and thence continued his journey by land to Constantinople. There he was very kindly received by sir Peter Wich, then our ambassador at the Port. His stay at Constantinople was short, because, having an earnest desire to see Grand Cairo, and meeting with a sudden opportunity, he readily embraced it, and after a peregrination of near two years, returned safely into England, where, in 1636, he printed an account of his travels, London, 1636, 4to, which soon after came to a second edition, and in 1638 to a third, in the same size. 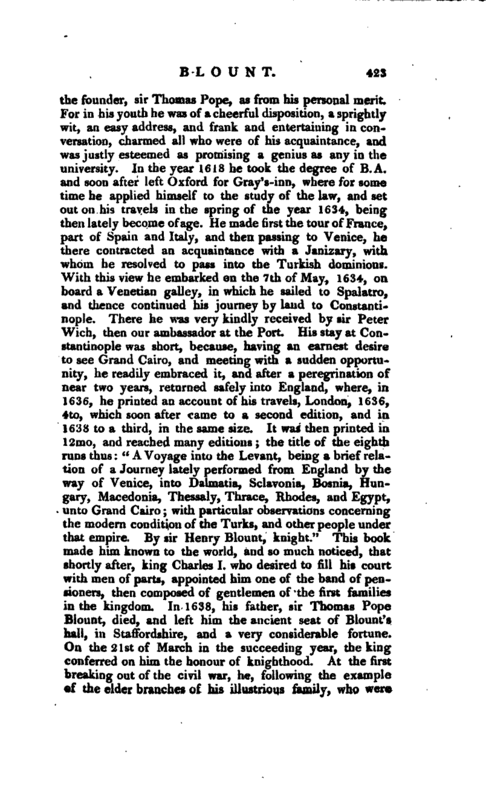 It was then printed in 12mo, and reached many editions the title of the eighth runs thus “A Voyage into the Levant, being a brief relation of a Journey lately performed from England by the way of Venice, into Dalmatia, Sclavonia, Bosnia, Hungary, Macedonia, Thessaly, Thrace, Rhodes, and Egypt, unto Grand Cairo; with particular observations concerning the modern condition of the Turks, and other people under that empire. By sir Henry Blount, knight.” This book made him known to the world, and so much noticed, that shortly after, king Charles I. who desired to fill his court with men of parts, appointed him one of the band of pensioners, then composed of gentlemen of the first families in the kingdom. In 1638, his father, sir Thomas Pope Blount, died, and left him the ancient seat of Blount’s hall, in Staffordshire, and a very considerable fortune. On the 21st of March in the succeeding year, the king conferred on him the honour of knighthood. At the first breaking out of the civil war, he, following the example of the elder branches of his illustrious family, who were | eminently loyal, attended the king at York, at Oxford, and other places, was present at the battle of Edgehill, and had there (according to a tradition in the family) the honour of taking care of the young princes. Afterwards he quitted his majesty’s service, and returned to London, where he was questioned for his adhering to the king but he being now grown a very wary and dexterous speaker, so well excused himself, by alleging his duty on account of his post, that he escaped all censure, and was thenceforward well received. 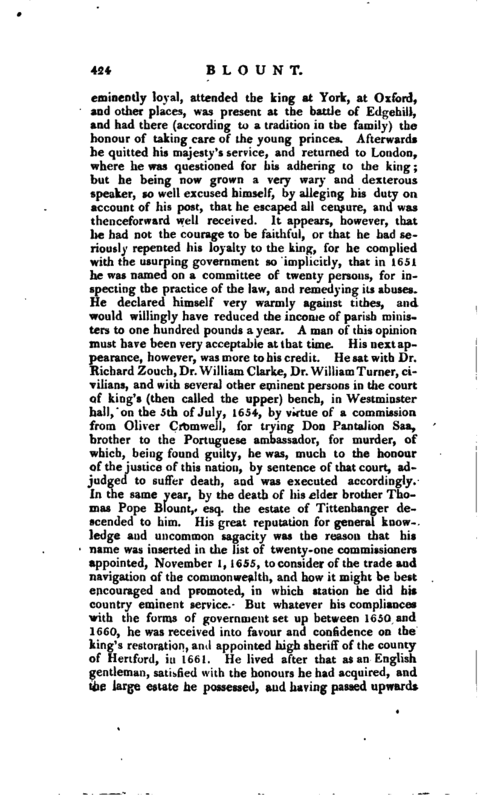 It appears, however, that he had not the courage to be faithful, or that Ije had seriously repented his loyalty to the king, for he complied with the usurping government so implicitly, that in 1651 he was named on a committee of twenty persons, for inspecting the practice of the law, and remedying its abuses. He declared himself very warmly against tithes, and would willingly have reduced the income of parish ministers to one hundred pounds a year. A man of this opinion must have been very acceptable at that time. His next appearance, however, was more to his credit. He sat with Dr. Hichard Zouch, Dr. William Clarke, Dr. William Turner, civilians, and with several other eminent persons in the court of king’s (then called the upper) bench, in Westminster hall, on the 5th of July, 1654, by virtue of a commission from Oliver Cromwell, for trying Don Pantalion Saa, brother to the Portuguese ambassador, for murder, of which, being found guilty, he was, much to the honour of the justice of this nation, by sentence of that court, adjudged to suffer death, and was executed accordingly, Jn, the same year, by the death of his elder brother Thomas Pope Blount, esq. the estate of Tittenhanger descended to him. His great reputation for general knowledge and uncommon sagacity was the reason that his name was inserted in the list of twenty-one commissioners appointed, November 1, 1655, to consider of the trade and navigation of the commonwealth, and how it might be best encouraged and promoted, in which station he did his country eminent service. But whatever his compliances with the forms of government set up between 1650 and 1660, he was received into favour and confidence on the ling’s restoration, and appointed high sheriff of the county of Hertford, in 1661. He lived after that as an English gentleman, satisfied with the honours he had acquired, and the large estate he possessed, and having passed upwards | uf twenty years in this independent state, be died on the 9th of October, 1682, when he wanted but four months of four-score, and was two days afterwards interred in the vault of his family, at Ridge in Hertfordshire. As to what appears from his writings, he seems to have had strong parts, a lively imagination, and, in consequence of these, some very singular opinions. His style was manly, flowing, and less affected than could be expected, considering the times in, and the subjects on, which he wrote. A Latin fragment, published by his son, in his “Oracles of Reason,” better explains his sentiments than all the rest of his works, and demonstrates that he was a man of an irregular way of thinking. 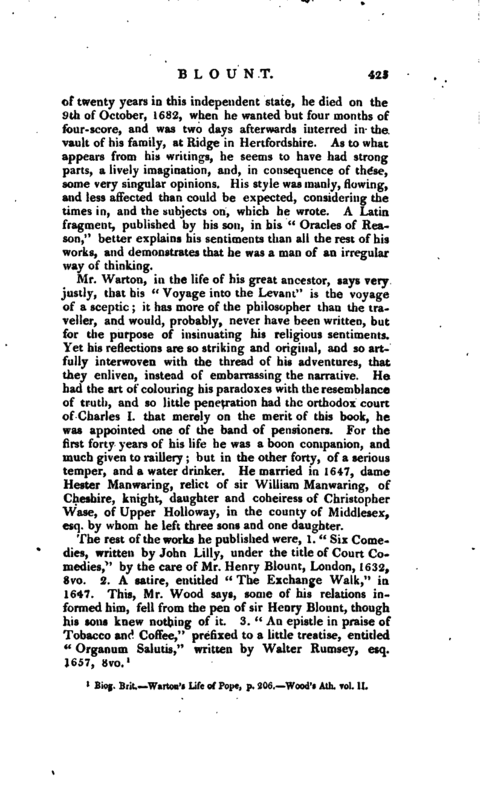 Mr. Warton, in the life of his great ancestor, says very justly, that his “Voyage into the Levant” is the voyage of a sceptic it has more of the philosopher than the traveller, and would, probably, never have been written, but for the purpose of insinuating his religious sentiments. Yet his reflections are so striking and original, and so artfully interwoven with the thread of his adventures, that they enliven, instead of embarrassing the narrative. He had the art of colouring his paradoxes with the resemblance of truth, and so little penetration had the orthodox court of Charles I. that merely on the merit of this book, he was appointed one of the band of pensioners. For the first forty years of his life he was a boon companion, and much given to raillery; but in the other forty, of a serious temper, and a water drinker. He married in 1647, dame Hester Manwaring, relict of sir William Manwaring, of Cheshire, knight, daughter and coheiress of Christopher Wase, of Upper Holloway, in the county of Middlesex, esq. by whom he left three sons and one daughter. Biog. Brit. Warton’s Life of Pope, p. 206. Wood’s Ath. vol. II.